The National Library of Virtual Manipulatives is a digital library that provides K-12 teachers and students with a wide variety of math activities and virtual manipulatives. These resources are arranged into five main categories: Number and Operations, Algebra, Geometry, Measurement, and Data Analysis and Probability. You can find manipulatives for all grade levels. Top axis of the chart features grades from Pre-K-2 to grades 9-12. Click on the grade level you are interested in to view and access its resources. As a teacher you may want to draw on NLVM resources to enrich your math teaching and provide students with challenging activities to fortify their math learning and help them develop conceptual and mathematical skills. Caveats are that the site is a little bit old and is not that user friendly. It might take you some time till you get used to it. Also, to view and make sure virtual manipulates applications work on your browser, you will have to install Java if your browser is not Java-enabled. 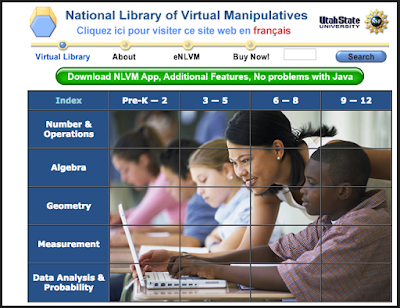 Please refer to this page to learn more about system requirements and other interesting tips to help you make the best of the National Library of Virtual Manipulatives in your teaching. For a detailed review of this website, check out this post.